Potamogeton tricarinatus is a perennial aquatic herb commonly known as Floating Pondweed and is a member of the Potamogetonaceae family. Plants have creeping rhizomes, stems that may be up to four metres long, submerged and floating foliage and emergent inflorescences. Submerged leaves are thin and translucent. Floating leaves are thicker, ten centimetres long, seven centimetres wide and with up to 17 parallel veins. 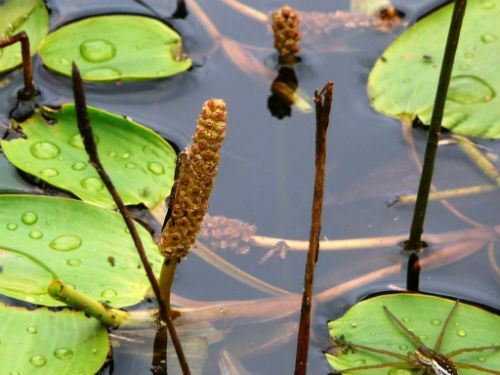 The inflorescence is held above the water surface and carries 12-20 flowers in a dense spike. Individual flowers are less than three millimetres wide. Flowering occurs between September and April. Floating Pondweed is widely distributed and occurs in all the eastern states including Tasmania as well as South Australia and Western Australia. P. tricarinatus is probably dispersed by water birds. We have Floating Pondweed on two of our dams. Plants just appeared. The dense surface growth has two advantages. The covering of foliage tends to reduce evaporation during the warmer months and Leaf Green Tree Frogs perch on the floating leaves. Propagation is by the division of rhizomes.